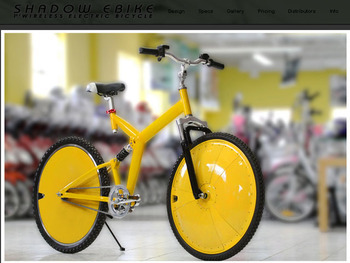 The Shadow Ebike is the first wireless electrical bike featuring wireless brakes, wireless throttle, and a wireless pedal assist system, with an integrated battery and motor design powered by the proprietary Daymak Drive Technology. It is a leading edge power-assisted bicycle with an integrated wireless design, meaning no wires in the open, which helps avoid the most common failures found in electric bicycles. .In terms of evolution, the Shadow is setup for future upgrades to interact with your iPhone, Blackberry and even your Google Phone or computer." The first Shadow Ebike will feature a 350W motor with a 36V 10ah lithium polymer battery. This revolutionary ebike uses frequency-hopping spread spectrum technology, ISM Wireless Frequency (2.4 GHz, to prevent interference.). 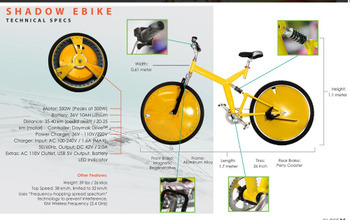 The market for ebikes is growing rapidly. Global production is approximately 27 million units and is expected to grow to 40 million units in 2011. “With the Shadow Ebike and the proprietary Daymak Drive, we are ready to enter the global market,” says Baiocchi. “We have already received expression of interest from around the world. This product is ‘green’ and as gas prices continue to rise, it makes for a great affordable alternative to gas driven vehicles.” The Shadow Ebike will be available this April, and is priced starting at $1,999.